The following videos have been provided by Clarksville Tennessee Vein Specialist Dr. Stephan Daugherty in order to help educate and inform patients as to what to expect during a vein care procedure. Clicking the thumbnails or links below will direct you to the video and page corresponding to the desired content. In this video Dr. Daugherty explains the procedure and walks the viewer through an actual microphlebectomy treatment. 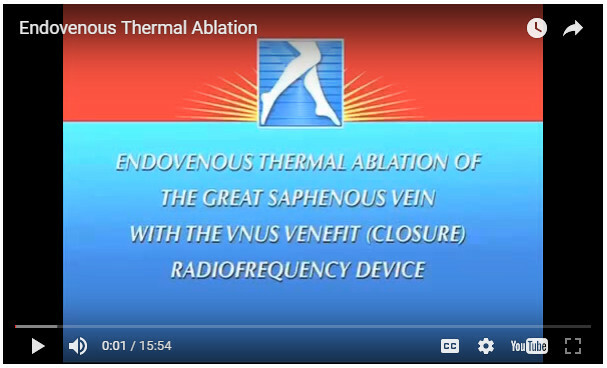 In this video Dr. Daugherty explains and performs an EVTA, or Endovenous Thermal Ablation procedure. Endovenous thermal ablation (EVTA) is the most common approach to treatment of an incompetent great saphenous vein. It is not feasible to repair the many failed valves in the incompetent vein, so treatment involves sealing the vein shut so it will no longer allow blood to flow downward with gravitational force when one is sitting or standing. Vein stripping, a surgical technique that involves pulling the vein out of the leg, usually under general anesthesia, is much more traumatic than endovenous thermal ablation. EVTA provides better results, involves fewer complications, causes consistently less post-operative discomfort, and is much less expensive than surgical stripping.